Russell - The second Resident Guest loco. Owned and built by Frank Martin from the Chivers kits and painted by Chris Clark. 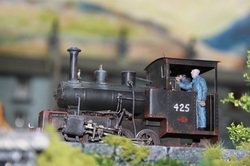 The model represents the Welsh Highland loco Russell in her current (2013) condition. 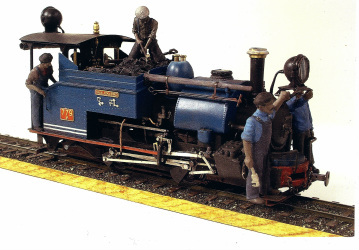 As shown along side she has the Bachman HO chassis recommended for the kit (and, as such will not run on Rhyd. There is also a 14mm chassis going through the works as we speak. Watch this space! Ex WD Hudson 0-6-0WT. The original Roy Link kit built by myself and Brian Love. This was going to be the first loco of my LROD empire - an ambition fired by visiting the late Henry Holdsworth and seeing his excellent 16mm scale models. An article by Brian Love on building this kit appeared in NG&I Review 49. Ex WD Hunslet 4-6-0T - This is the Chivers kit built by Brian Love and finished in 1919 condition. This was the second locomotive type built for LROD - the Light Railway Operating Department of the Royal Engineers during the First World War. I was leaving Spooners Bar, head south. "Something interesting coming down the line," said my mate. "What's that?" I asked. "Can't say. But if you stop at Minfordd you should see it." So stop at MInfordd we did. We thought we had missed it; whatever it was but then ... in the distance we heard a whistle. Ever so slowly we became aware of the sound of a steam loco approaching, and then it was on us. A blue DHR 'B' Class loco and three coaches. Magic. I had to have one and this is it. Brian Love has now finished the EDM kit. You. like me, can see it for the first time at Swanley, up until then here are Brian's latest photos. Wonderful. 'Exe' 2-6-2T Manning Wardle - Exe was built for the Lynton and Barnstable Railway which ran until 1935. Exe was built by New Zealand modeller Paul Berntsen from a Roy link/Alan Gibson kit and is shown in her early Southern livery. 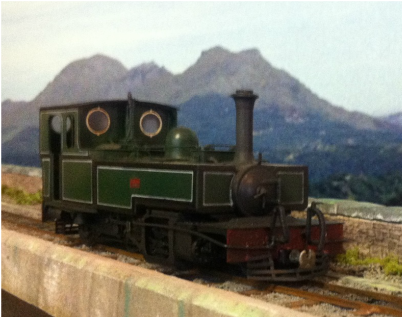 The FR has built a replica L&B locomotive and that was the only excuse I needed!